Unique Hand Made Patchwork Bag. Fabrics French with pieces of faded old quilts. French ticking handles lined with antique white linen. The reverse is antique French linen. 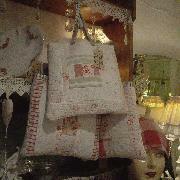 Please note that these bags are more decorative than practical as the fabrics are delicate. 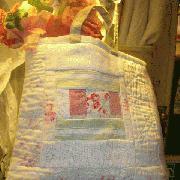 Unique Hand Made Patchwork Bags. Fabrics French with pieces of faded old quilts. French ticking handles lined with antique white linen. The reverse is antique French linen. Please note that these bags are more decorative than practical as the fabrics are delicate. Please choose which bag you would like from left to right, 1-3.